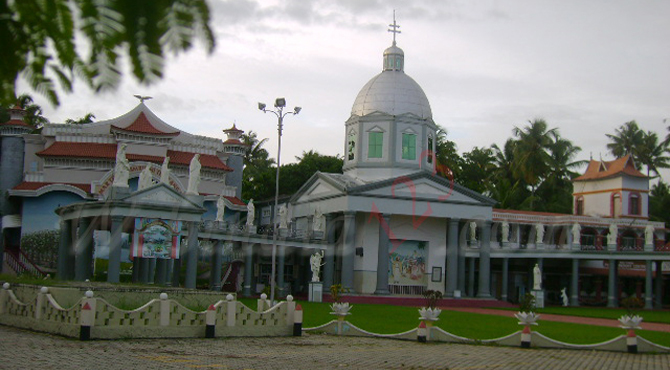 The Mar Thoma Pontifical Shrine, a monument to St. Thomas is situated at Marthoma Nagar, Azhikode, Kodungallur, Kerala. Built in the model of St. Peter's Basilica, Rome, this shrine is a historic pilgrim centre of the Indian Christians, situated on the beautiful banks of the river Periyar. It is known from historical evidence as well as from the living traditions of the people that St. Thomas, one of the 12 disciples of Jesus Christ landed in Kerala, on November 21, 52 A.D. at Kodungallur, then known as Musiris. After sharing his deep faith experience with the people of India, St. Thomas himself is believed to have formed seven churches or Christian communities here in Kerala, the first one being in Kodungallur itself. Kodungallur or Musiris, an ancient harbour, lost its ecclesiastical significance and commercial prominence due to the attack of Tipu Sultan and the development of Cochin port in its place. But its historical importance was rightly acknowledged when on the occasion of the 19th centenary celebration of the coming of St. Thomas to India, Holy See, the official seat of the Vatican, thought to offer a befitting gift to St.Thomas Christians in Kerala. Late Eugene Cardinal Tisserant, the then Prefect of Oriental Congregation solemnly brought the bone of the right arm of the apostle from Ortona in Italy and enthroned it in the present Shrine on December 6th, 1953. From the great day onwards, the Shrine has been attracting pilgrims from all over the world irrespective of caste and creed who come to venerate that hand which belonged to the great Saint, a disciple of Lord Jesus Christ. The Marthoma Pontifical Shrine carrying the holy relic of St.Thomas was entrusted by the Holy See to the C.M.I. fathers of Devmatha Province, Thrissur. The relic is enclosed in a glass case and exposed daily from 9am -6pm for veneration of the faithful with befitting briefing. There is also a repository of Holy relics of Bl. Chavara, Bl.alphonsa and Bl. Mariam Teresa. Special mediatory prayer services (Novena) is conduced on request every Sunday. The main feast of the church is celebrated on November 21 in Commemoration of the apostles 'Entrance to India' and it lasts for a week. A memorial presentation, 'Marthoma Smruthi Tharangam' depicts the vision and mission of St. Thomas to the innumerable pilgrims who throng to the shrine, for faith experience and spiritual solace. Modern computer technology and audio-visual theatrical effects gives an enlightening account of the Saints life in an half an hour programme with a seating capacity of about 80 persons. 'Marthoma Smruthi Tharangam' in Sanskrit, literally means the creation of waves of memories regarding St.Thomas. The memorial presentation is artistically depicted in a 3500 square feet large aesthetically designed mansion built in Indo-Persian style. The multi-colour image works and sculpture designs will transcend the heart and mind of the pilgrims to the major episodes in the life of St.Thomas which is systematically and scientifically arranged in four different levels. It depicts the scene of Jesus commissioning the disciples to the different parts of the world, to the stories of the great entrance of St.Thomas to India, his apostolic activities in different parts of Kerala, his mission and martyrdom at Mylapore in Tamil Nadu, the preservation and enshrining of his mortal remains at Edessa and Ortona and the enthronement of his holy relic at the Marthoma Pontifical Shrine. The Marthoma Research centre here gives sufficient information regarding St. Thomas and Indian Christianity and the pilgrims can buy religious book from the book centre. There is an ashram of the CMI fathers here and accommodation for the pilgrims are arranged on request at reasonable costs. There is also a canteen for refreshments. Pilgrims have facilities available for boat rides in the river Periyar.